Sometimes You Can Actually Observe Manifesting Working For You! Here is a not-often talked about aspect of manifesting. As your thoughts are building, and they do, you will sometimes see those ideas emerge into your life in interesting ways. It is a very common occurrence and easy to spot for example, when we are manifesting careers or romantic partners. You may suddenly meet a romantic interest or find that better job. It may seem to be just what you are asking for, but they are often part of a process to the higher goal you desire. That next job or partner may not be permanent but it is an important learning experience, not just another bad piece of news. It is part of the manifesting process, a bit of the roller coaster at times, but the trend line is upward. As we move forward, these encounters provide growth and we improve as we go forward. We become the better ‘match’ for the ultimate goals we seek. Sometimes what we are manifesting doesn’t come exactly as we would imagine or at what we believe to be the optimal time, but that’s ok. The ultimate outcomes are often better and more timely than we could have possibly imagined. Until them, be aware that these experiences give us a hopeful glimpse of the manifesting process at work. In V’s story, she discusses instances of what seem to be coincidences that follow her recent thoughts. This is likely another instance, although a subtle one, of her thoughts beginning to create reality. Have fun with these! 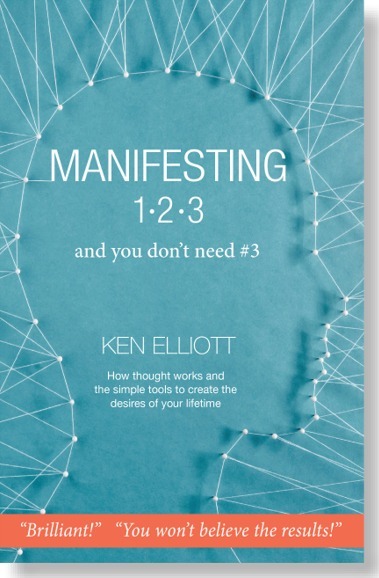 I have been using what I learned from Manifesting 1,2,3 and you don’t need #3 for some time now. I have a daily manifesting regime that time and again, had shown me that manifesting really works. I also do a quick meditation each day to create calm for myself and to reinforce my more formal manifesting practice. Lately I’ve noticed something happening that is mentioned in the book. I have a thought about something and I quickly get a response on exactly what was on my mind. The book called it a ‘bleed over,’ like the dye on a fabric moving from one part of a fabric to another place. As the book describes, our thoughts are taking form as we think them in the non-physical world and sometimes we can observe them beginning to take partial form in our physical reality. It is like little hints telling me that my thoughts are really working to make things happen. In the last couple of weeks I have happily seen what looks like coincidences matching some of my most recent thoughts. Some of these are casual ideas and not yet included in my daily manifesting exercise. These ideas may seem trivial, but they have some merit and it is exciting to quickly see an apparent response to what I was thinking. I recently noticed one of those quick responses when I began considering a dog sitter. In a couple of days time I got a call out of the blue from a friend in a town nearby that made a point to tell me she has begun sitting for dogs and asked if I need her services. She lives a bit too far away for me to use her but it was amazing to get an unsolicited call like that. Here’s another example. I am a fabric artist and my husband and I are casually looking for a different home to rent. Our present place is comfortable, but there isn’t a real studio space for my work. Our present residence is a rental and our main home in another state, but for now we are renting this smaller place as my husband’s work requires it. Getting a larger rental here with a studio space for me is not a high priority, but it would be nice. So, I was much surprised to see this notice come up in my email yesterday, “fiber artist home for sale.” OK, t was a lead from a fiber art magazine I subscribed to, but I had never seen a stand-alone solicitation for a home in my email like that before. It was wonderfully odd and encouraging. As it was with the dog sitter, the home was a bit too far away for consideration, but had either of these things had been closer in, we would have been very interested in the idea! It feels like we are in the right place for the better solution to appear. I feel that my thoughts are really out there making things, just as the book describes and if we are observant, the universe may be letting us know that the message is received and is being worked on… just be patient and don’t give up. Coincidence or not, this feedback makes manifesting fun and indicates that it is not a hopeless endeavor. And one more thing…when my husband and I were out driving the other day, it was nice to see the road sign that said, “You are loved.” We wanted to pass it onto you today. The closest thing to a magic wand you will ever get! Through this insightful and EASY book I have manifested a perfect location for my workshops, great parking places, more clientele for my business and more money. Ken’s method is so simple and fun. It helps one to embody the most important quality for manifesting anything….Gratitude. Thank you, Ken Elliott. I am SO GRATEFUL you have written this book!